"If you want to see a tribute to Frances Strachan – look around you," said Rev Dave Whiteman. He was referring to the number of people who attended her funeral service last week and the fact that Ayr Crematorium was packed with mourners, many of whom had to stand and many others who had to stand outside. "Frances was a remarkable woman - and once met never forgotten," said Rev Whiteman and went on to recount her working life with Helen McDonald’s and Myrtle Bridals for some years and latterly at Maybole Health Centre. "But her life was her family and the Guides," he continued. "She was the inspiration and the driving force behind Nether Auchendrane (the Guide campsite), together with her Clerk of Works, her husband Jimmy." He then invited Miss Iris Richardson, County Commissioner for Ayrshire South to pay tribute to Frances. "Her life was truly devoted to the Guide movement here in Ayrshire and further afield," said Miss Richardson, adding that Frances had been presented with a Good Service brooch in 1990 and in 1995 she became a County Vice President. "Only last November," she said, "it was to everyone's delight that I was able to present Frances with the Scottish Chief Commissioner's Award. She was the first person in Ayrshire South to receive the award which is given for dedicated service to Guiding, and no one could have been more deserving of it." Frances was Guider of 1st Whitletts Guides, 1st Tarbolton Guides and finally 1st Maybole Guides, where she took the company for 18 years. She was also Maybole's District Commissioner for a spell. 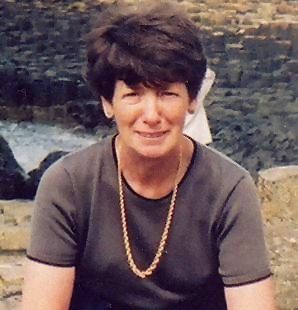 Frances also served on the County Executive committee with four County Commissioners as County Camp Adviser, County Outdoor Activities Adviser and latterly as Guider in Charge of the county's campsite and activity centre at Nether Auchendrane and as chairperson of its management committee. "When we think of Nether Auchendrane, we can't miss but associate it with her name," said Miss Richardson. "She worked tirelessly for the centre throughout her Guiding life - in its old form of a wooden hut and field, and in its present form of house and campsite. She played a huge part in raising funds to build the new centre, and in the preparation for its opening when we welcomed H.R.H. Princess Margaret." "She continued, "Frances was so proud of Nether Auchendrane and took great delight in showing it off to people who visited. Along with Jimmy, she put in more hours of work out there than any of us will ever know, making sure everything was just perfect for visitors, or sometimes just pottering about the place because she loved doing so. No matter what the crisis was - from flooded basements to blocked toilets she got mucked in about it and could always see the funny side of any crisis once it had been fixed. As Guider in Charge at Nether Auchendrane she forged friendships with groups who revisited the centre including Guiders from Canada, America. Ireland to mention but a few." Miss Richardson went on to say, "Frances loved fun and took a keen interest in everyone she met and was much respected by the youngsters entrusted to her care. She was a keen camper who enthused many girls to sample the joys of camping and other outdoor activities. She represented our County at several Scottish and International events and in the summer before she fell ill, Frances was Guider in Charge of our sub camp at the World Camp in Foxlease, Hampshire." "It was with a great sense of sadness and disbelief when we learnt that she would not recover from the cancer which eventually ended her life on Thursday of last week. The number of Guiders past and present here today demonstrates the fondness and respect we all had for her." "I know that I speak for so many of us who were so privileged to have shared her life and who feel so much richer for having known her. We will miss her so much." In December 1999 Frances was also presented with a Scroll of Appreciation from Maybole Community Council in recognition of her service to the community with her work for the Guides. Appointed as a Justice of the Peace two years ago her illness delayed her training as a magistrate but she completed this a few months ago and was due to sit on the bench at Girvan District Court this winter. "Frances Strachan was a woman of great courage," said Rev Whiteman. "She had great inner strength, great humility, and great dignity. She was kind hearted and generous, always having time for other people." Frances is survived by husband Jimmy, sons Stuart and Douglas, daughter Sheena, and grandchildren Jade and Ciara.